MÜHLE UK: What inspired you to develop the Silvertip Fibre® Brushhead? Andreas Müller: People are drawn to dense and thick badger shaving brush knots because these bundles provide more ‘backbone’ which is of benefit while shaving. The downside of dense bundles is that they are hard to rinse thoroughly and they need longer to dry- both of which are important, otherwise the brush can shed hair eventually. We wanted to provide a vegan option for our customers that prefer animal-free products and we wanted the vegan option to retain the benefits of premium natural hair without the downsides; a brush with very soft tips, good backbone and at the same time easy to maintain. MÜHLE UK: How is Silvertip Fibre® distinctive from the Black Fibre Brush or and other synthetic shaving brushes on the market? Andreas Müller: Silvertip Fibre® is our premium hair grade. Just as Silvertip Badger is processed by hand Silvertip Fibre® is also processed by hand. Black Fibre is our basic synthetic hair grade and is processed by machines. Where a natural brush has varying hair types, a synthetic brush has different fibre types that vary in length, thickness and some are curled more, others less. Our Silvertip Fibre® and Black Fibre brushes consist of 7 different types of fibres. The specific mix in Silvertip Fibre® guarantees the properties mentioned above; soft tips, good backbone and easy to maintain. MÜHLE UK: What are the advantages of using a premium synthetic brush, as oppose to a natural brush? Andreas Müller: First of all MÜHLE synthetic brushes perform very well, furthermore they resist soap and foam residues and they are very durable. MÜHLE UK: The MÜHLE Travel range comprises of only Silvertip Fibre® brushes, why is that? What is it about Silvertip Fibre® brushheads that makes them so durable? 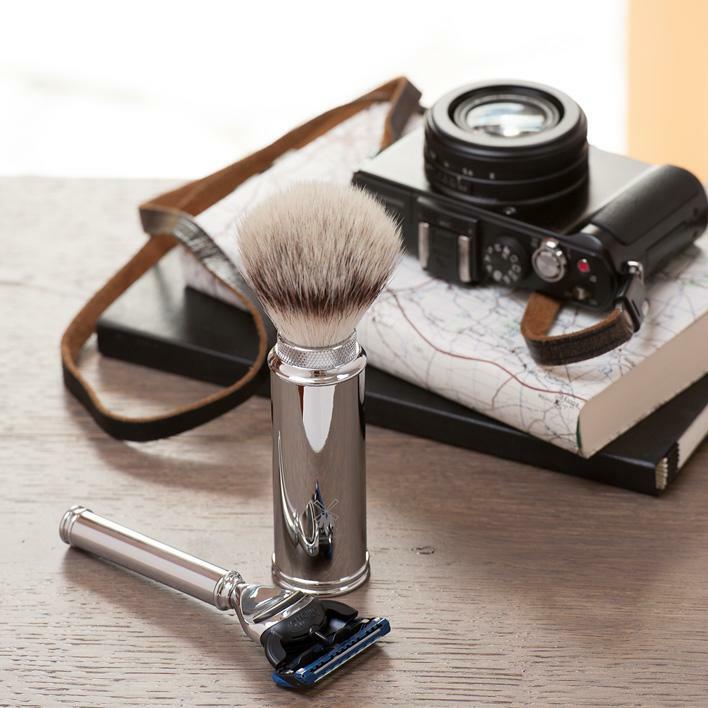 Andreas Müller: Whilst traveling shaving brushes need to be stowed away in a toiletry pack or container. The MÜHLE travel brush has been conveniently designed so that the brushhead can be stowed in the handle which acts as a container for the brush while you’re on the go. Silvertip Fibre® dries quickly and resists residues so it is well suited to this, however badger hair requires time to dry and must not be stowed away while it’s wet. MÜHLE UK: Is a different technique required when using a synthetic brush as oppose to a natural brush? Andreas Müller: No, using a synthetic brush is just as easy and convenient as using a badger hair brush. MÜHLE UK: Is the Silvertip Fibre® brush particularly suited to any skin/hair types? Andreas Müller: It definitely is. I´d say it feels even more gentle on the skin, thus it’s particularly suitable for very sensitive skin types.